I've got a 2002 Xlt 2wd.. I like the aggressive looks that most 4wd trucks have, like larger tires, and I was wondering if it there would be any point to putting bigger more rugged tires on a 2wd. I'm thinking leveling it out and getting 31's. somewhere down the road I plan on getting a rear locker but would I be a 'poser' of sorts by doing this? There are all kinds of people lifting 2wd trucks and adding larger tires. I don't see any reason not to! 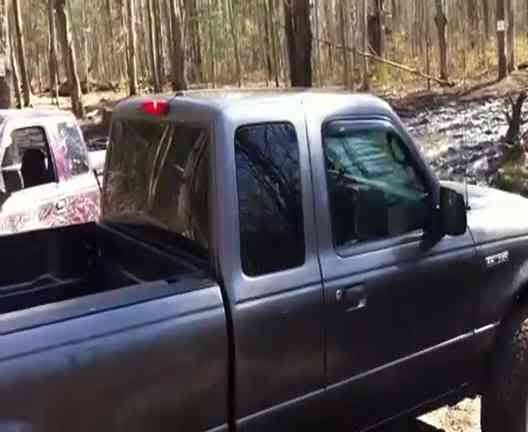 Putting bigger offroad tires on your 2wd ranger does not make you a poser, not using them does. 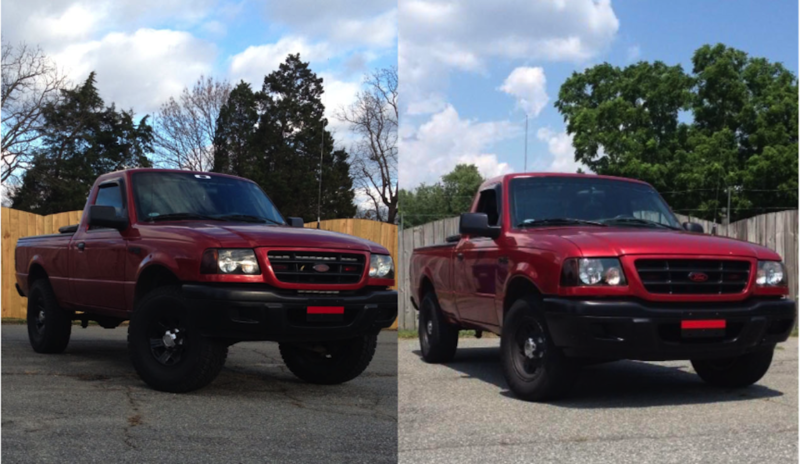 ^ you'd be hard pressed to find someone that would call my above ranger a poser truck, and it is a lowly 2wd. Sick video. Sick truck. I would most likely get all terrain because I mostly drive on the asphalt as my daily driver. The only thing holding me back from more offloading is the small stock tires. What would you say for a something like that? 31's? 30's not too large I wouldn't say since its a daily driver. 32's make a fine DD tire. i daily drive 33's no problem. its more about driver ability then 2wd. my 2wd makes people think its a 4x4 with the places it goes. the only times ive been stuck, were when the rear wheels arent touching the ground. 31's are around 800 new, leveling if you have torsion bars is as simple as a slight crank of a bolt. LOL at all the 2wd guys defending you. As a 4wd guy, I don't really care what ya do. You're not a poser because you like the look of a lifted truck. My truck may be 4WD but I lifted it because I liked the look, the added off-road ability was just a bonus. But in the past, on this forum, some 2WD guys have claimed they are equal/better than 4WD guys. That's always funny. Having a sick looking lifted 2WD is one thing, getting cocky about it is not. Well at a point you might have a 2wd that could outperform a 4wd but for the most part 4wd>2wd for most all scenarios. Also it's easier to lift a 2wd way up so if you're just going for looks, go 2wd. I doubt anyone thinks a 2wd can make it where a 4x4 can. No matter how much you talk it up. No, it won't lol. But you wouldn't know, since you're 2wd. Let's see you climb over a 6 inch curb in a wet parking lot, in your locked 2wd. you both have already had this same exact argument on here in the past. Lets not destroy this thread with it again..
this.. ive seen 2wd locked mob on 4x4 open open. lets do it when and where brah haha. gearing and lockers/ls is everything in a 2wd, and because we wheel 2wds on a weekly basis, we know how to drive better and use what we got. ill see your wet parking lot 6" curb and raise you a mudhole deep enough to dip my bumper on a lifted truck on 33's with nothing more then limited slip. Once my locker shows up and is installed, ill be sure to show you how i can drive with a rear wheel in the air. And as for my 2 cents, living here in SoCal 4wd is pretty pointless as I've never been stuck and I do a lot of offroading/exploring around here. Where you live im sure it's different... no need to hate on eachother because of that though. As for 2wd vs 4wd. Again out here 2wd > 4wd because travel is more important than the front tires spinning. It is much cheaper/easier to get good numbers out of a 2wd xlt than it is a 4wd truck. 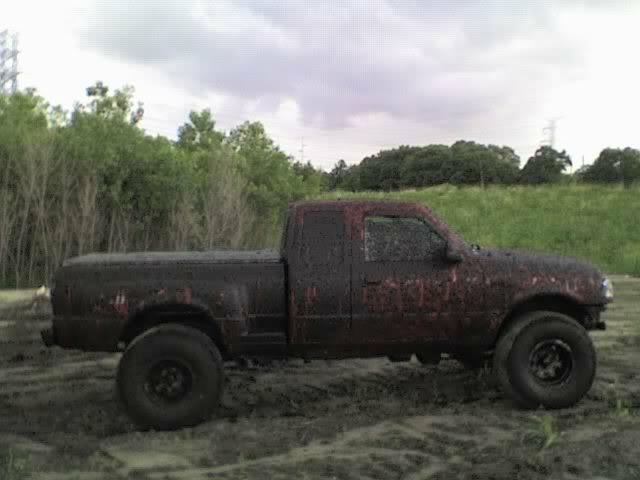 In a swamp or mud or whatever you have, sure 4wd is obviously better. 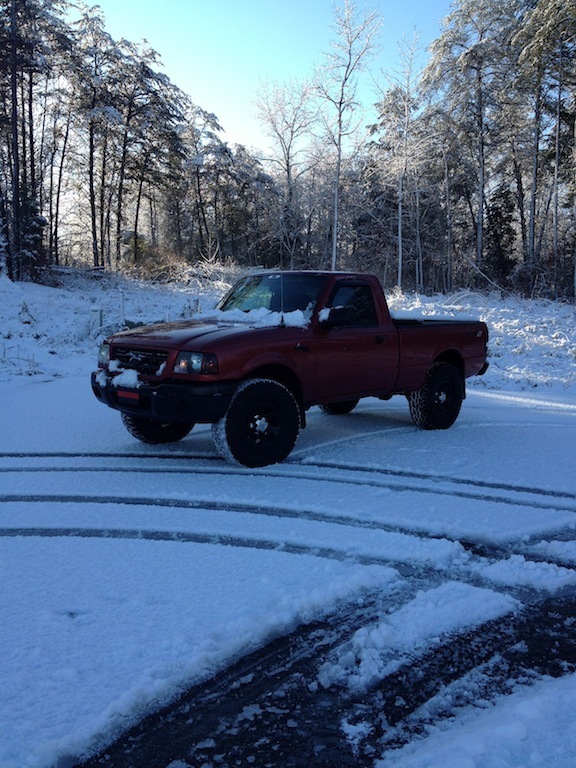 I mean my 2wd has been getting through 8 inches of unplowed snow all day just fine. But yeah a 4wd would prolly be even better. 2 & 4 wd are good for different things. You guys are SO cute. I wish that somehow Oprah could just drop in this thread and give you all 4WD so you'd chill out on the "OMG 2WD is SO much better than 4WD" syndrome. I love how you are blowing everything out of proportion. Your picture proves nothing (neither do), I could get the same results going back and forth in a mud hole just like anyone else. My point is that 2wd xlt = more potential travel for far less $ = better than 4wd for the terrain here. I have a better point... FORD RANGERS ARE COOOOOL. favorite example of 2wd ability. Quick Reply: Bigger tires on 2wd pointless?